It PAINS me to write this review. I am, after all, the person who made up her very own kitty litter recipe. And that kitty litter is pretty darn good, if I do say so myself. When Drew from World’s Best Cat Litter offered to send me a bag of litter to test out, I did warn him that I’m something of an expert. I mean, for me to actually want to buy kitty litter it has to be markedly better than the stuff I make for about 3 cents worth of baking soda per batch. So I was incredibly skeptical. If I’m being completely honest, I kind of wanted it to fail. But if I’m still being completely honest, I have to admit that it’s the best kitty litter my cat has ever used. I’ve been using World’s Best Cat Litter in the cat’s litter box for three weeks now, and I have to say that it really does live up to the name. World’s Best Cat Litter is made from milled whole-kernel corn and is completely biodegradable. It clumps! It’s flushable (make sure you’re cat is tested for water contaminating parasites before you flush kitty litter)! It controls odor REALLY well! It’s not super dusty. The cat doesn’t track it around the house all that much, but the little she does track gets picked up by the vacuum easily. And the litter itself lasts a really long time – since you’re scooping, you just need to add a little new litter here and there without switching out the whole box every week like I have to do with homemade litter. My cat took to it immediately – although that’s one area where she excels – she may be mean as all get out, but she’s very accommodating about changes in litter materials. Since my cat had a urinary tract infection a few months ago, I appreciate that the litter is light enough in color that I would notice blood in the litter box if she got another infection. World’s Best Cat Litter does come in a plastic bag, and it does cost more than 3 cents a batch, but I will admit it’s a lot more convenient than making your own, and a lot safer for your pet and easier on the environment than some of the conventional litters out there. It also works better than the conventional litters that I used to use years ago. 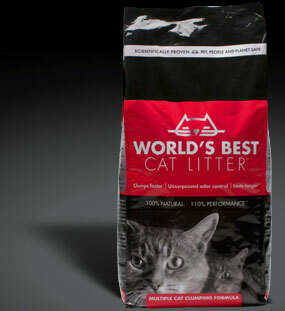 I think World’s Best Cat Litter is a fantastic option for someone who doesn’t have the time to make their own litter, but still wants to use a clay litter alternative. And I also have to admit (even though it’s really hard for me to!) that I plan to keep a bag on hand for when I don’t have the time to make my own. Sheesh! Oh, man. Now you’ve gone and gotten me excited about kitty litter. I’m not sure how I feel about the fact that I’m the kind of person who can get excited about kitty litter. But… I kind of want to try it! I almost want to go out and get a cat just so I can try out some litter! I absolutely agree. I was using Swheat Scoop but when we got the little one she got a uti and learned to hate the litter box. I had to change litter and was using a clay litter for a few years. Then I read about Worlds Best and figured I’d give it a try and they and I LOVE it. I will never switch again. I however do find it really dusty. Both my cats are black and they are aggressive diggers and they come out of the litter box covered in litter dust, it’s quite hilarious and the only downfall that is fine by me. I hate the be the dissenter, but I wasn’t happy with World’s Best – at all! It was super dusty and made of corn, which I wasn’t all that keen on. I assume it’s made of a corn biproduct from GMO corn, which I’m not sure I want to expose my cats to (reason #1 I buy premium cat food). One of my cats developed a pretty bad asthma problem while we were using this, I assume due to the corn. We switched to Swheat Scoop which isn’t great at odor control and is still fairly dusty. We finally switched back to clay and our cat is having much less trouble with his asthma, he gets better each day. I’ve been toying with the idea of using plain sand with baking soda mixed in. I’ve heard this works great. I’ve been using America’s Best for years. I love it. My two cats love it–one of them so much that he sometimes has a bit of the corn for a snack…! It’s great for odor control, lasts a lot longer than other litters (including crystals pine nuggets), and one of the best parts is that it’s flushable. My 6cats tried WBCL over SweatScoop, most of them avoided WBCL. I don’t like its smell. I won’t go back to it. Also the bag is plastic #7, which was recently on the news that #7 contains BPA. Can’t throw it in recycling either. No thanks. SwheatScoop bags are paper and are recyclable. I would not recommend this at all…I was so excited to finally think I could use something that would help make the cats room not smell so bad from the litter (which I clean daily) I have 2 cats. I was so dissapointed! We have a foyer tha is closed off with a “kitty door” so they have their own privacy to go potty…and sitting in my living room all I could smell was a mixture or urine and corn…not a good mixture!…this is NOT THE WORLDS BEST CAT LITTER! Good kitty litter lives up to it’s name and bad kitty litter is worse then no kitty litter. I don’t like WBCL either. Used to use it, and got tired of the smell. It has an odor I just don’t care for. I clean the box every day, yet it still smells unpleasant. I prefer Swheat Scoop, and used it for years, although am currently using Better Way. I wanted a litter whose clumps didn’t fall apart. That’s the only thing I wish Swheat Scoop would improve. I have to add a lot of baking soda to get it to clump better. 2nd time I bought a big bag and noticed when I got home bag had a hole in it. So I pay alot then lose it too, great. I was excited to try Worlds Best Cat litter because I heard it was supposed to be “the best”. There’s only two things good about it–the price- $4.97 for a 34 lb bag at Costco-Wow! I thought this is great. Also, the bag was easy to carry. But it’s probably the “worst” litter for odor. The urine smell seemes to be enhanced with that stuff, even when I use the Arm and Hammer deodorizer! The litter has an offensive odor alone. Going to have to go back to the bad stuff I guess. I don’t understand all the hate WBCL gets.. Is it because it’s more “pricey”, therefore people have extremely higher and unrealistic expectations? Or is it because your cat was friggin’ allergic to corn? If the latter is the case, it wouldn’t make sense to insult or undermine the litter’s quality! It’s just not right for your cat! I feed my kitties the most premium cat food I can find on the market, so therefore, it’s only natural that I choose to buy the most premium cat litter I can find.. And I have found that WBCL is far superior than anything I have ever tried, especially when it comes to odor control. I find it insane how some people have even commented about how they’ve “gone back to clay litter” because WBCL was so horrible.. SERIOUSLYYYY? I find it a joke that Fresh Step or Tidy Cats can beat WBCL! The ONLY cat litter that I truly believe can give WBCL a fair competition is Feline Pine. Yes, they’re made of completely different substances.. However, Feline Pine is probably the most effective at controlling urine odor among ANY cat litter you can buy. I would also say crystal based litter works similarly. I honestly don’t think my kitties would be comfortable standing on large, hard pine pellets or sharp crystals though. So all in all, World’s Best Cat Litter works best for me and my babies, and I feel that it deserves better reviews. For me, going back to any brand of generic clumping or clay litter would be like saying you’ll pass up the fancy champagne for a can of Bud Light. Ridiculous!! !